Before we get to the free VPN side of things, let’s start with Kodi, which is a free and open source media player. The software was originally made back in 2002 as a homebrew media player for the original Xbox platform. 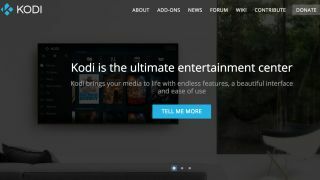 With that origin, it follows that Kodi is designed for a “10-foot user interface” designed to be used from the living room couch, rather than a traditional computer. These days, Kodi is an open source software media center. It is available as a download for a number of platforms, including Windows, Mac, Linux, iOS, Android, and even the Raspberry Pi. Kodi is notable for the wide variety of audio and video formats supported, which can be used to stream content both on the local network, or over the internet, and also for its active community forum. A big plus of Kodi is that it supports a number of add-ons, allowing it to be easily customized to a variety of applications. However, this also provides a significant downside, as many of these add-ons can potentially contain security flaws. Therefore, users often seek to combine Kodi with a VPN to protect from getting hacked. Another good reason to employ a VPN while using Kodi is to bypass geo-restrictions, thereby enabling content to be viewed that would otherwise be restricted based on your location. Now ideally, when a VPN is needed, such as for Kodi, the solution is one of our choices of the very best VPN services for which, we're afraid, you have to pay. The benefits of unlimited data, and priority bandwidth, are really what is needed to stream audio and video, which will in turn produce the best experience, rather than stuttering video waiting for the buffer to fill. After all, we all know that VPNs have no reason to give any priority to users of their free tiers, which is why many of the VPN services do not even offer one. Naturally, anything worth doing is worth doing right, so we recommend a paid VPN plan which will have a larger assortment of servers in more locations. However, for more casual users that just want to give Kodi a try, there are some possibilities for a free VPN provider. That said, they do come with some strings attached such as a low monthly data limit, and recall that standard definition video consumes about 1GB of data per hour of streamed video, and this increases to 3GB for HD video, so users are likely to hit their data cap fairly quickly with any amount of regular Kodi usage. Windscribe has a well recognized paid VPN plan, but they are also known for their free offering. Users are required to provide an email address, and can access servers in 10 countries, more than some other free providers. Windscribe also claims, even on the free tier, that “We don't keep any logs, so your private data stays with you,” and can unblock geo-restricted content. Their other notable feature among the free VPN services is that their monthly data limit is higher than most at 10GB. Also, unlike a free trial, it resets monthly, so this can be a sustainable free VPN solution for a casual Kodi user. The Swiss are known for privacy laws that are literally part of their constitution along with the finest wristwatches, the Matterhorn, and private banks. Switzerland also brings us excellent VPNs such as VyprVPN, which while affordable, unfortunately lacks a free tier. However, another Swiss-based VPN, ProtonVPN, does offer many of the Swiss advantages, and has a free tier. ProtonVPN’s low number of servers on the free tier (three) can be somewhat limiting for accessing geo-restricted content, and free users are also restricted to a single device, but there are other features that balance these limitations out. The major plus is that unlike most other free offerings, ProtonVPN does not have a monthly data limit, making it an excellent choice for video streaming that will consume lots of data. Their software also includes an integrated automatic kill switch. Finally, we recently went through setting up their free tier offering, and found it simple to configure, and quite stable for use with Kodi. Another free VPN to consider is Hideman VPN. When TechRadar tested it, we found multiple issues with the free tier, including that data is limited to 2GB each month, which is less than an hour of streaming HD video. Also, there's the total lack of servers in the US or UK, with only four available worldwide. While speeds were acceptable during our review, during congested times, Hideman VPN has the option to throttle throughput to a pokey 512 kbps, which is not even enough for streaming video in standard definition that needs 3Mbps, let alone an HD stream that should have at least a minimum bandwidth of 5Mbps. A final free VPN for to consider for Kodi streaming is VPNBook. This provider has its servers in Romania, another favorable location for privacy. An additional benefit is that no registration is required. A downside of VPNBook is that it does not offer an app, so users must get into the settings to manually configure the VPN via an OpenVPN client. The other fly in the ointment is that it is an ad supported service. Still, VPNBook does offer no data limits, and decent bandwidth, so from that standpoint, it is worth considering as free VPN service to combine with Kodi.